This tasty Easter side dish recipe is the perfect accompaniment to the Easter main dish recipe that I posted yesterday! 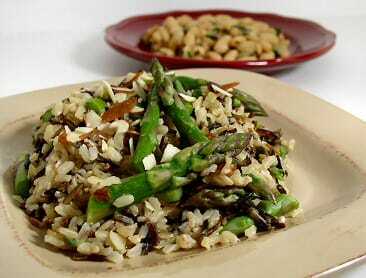 It’s a fantastically delicious Weight Watchers Recipe for Wild Rice, Barley, and Asparagus Pilaf and it has just 1 Weight Watcher Point per serving! It’s easy to make and is loaded with heart healthy fiber, protein and vitamins. I love that this rice recipe doesn’t look or taste like it’s low calorie and actually good for you. Whether it’s with you Easter dinner, or any meal for that matter, this Wild Rice, Barley and Asparagus Recipe is definitely a great choice – your whole family will love it! Stir in the asparagus, cover, reduce the heat even further and simmer slowly for 5 minutes. Set aside off the heat, covered, for 10 minutes before fluffing with a fork. This has become one of my favourite recipes. It is great as a lunch on its own or as a side dish with a variety of meats. Thanks for sharing! I found this recipe and tried it because I was wanting some healthy dishes for our Easter dinner. My husband was very skeptical about this "diet food". Everyone ended up loving it. I had to share the recipe with everyone and now I am making it again for dinner because my husband requested it. I just figured the new points plus value and was disappointed a bit to find that it is 3 points instead of 1, but that doesn't change my mind about this recipe. It's a keeper. Are these the old weight watchers points or the new system that started in January? Most of my old recipes still have the old Points, but I am doing my best to convert them over time, however, it's taking me a while to gather all of the nutritional information for them. You can tell whether the recipe has the Points or Points Plus by looking at the title. If it says "Points +", it's the new Points Plus, and if it says 'Point Total", then it's the old Points system. Hope that helps, and thanks for reading!